UPDATED: Morning rush hour traffic counts show a 45% increase in the amount of cyclists entering Dublin City Centre in the five years since 2006. The traffic counts show a 15% increase in the average amount of cyclists last year compared to 2010 and a 35% increase in the last ten years. The counts records cars, buses, taxis, bicycles, motorcycles and pedestrians entering the central area between 7am and 10am and are conducted each November. 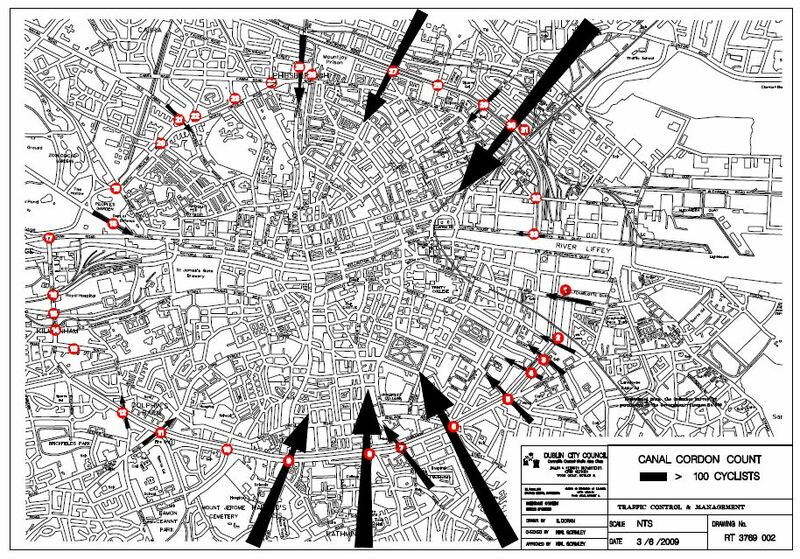 Dublin City Council’s annually ‘canal cordon’ traffic count only includes traffic crossing points roughly around the central sections of Grand and Royal canals (and the west ends of the North / South Circular roads) at the peak morning time. All Dublin Bike stations are currently inside the canals, therefor few of the many Dublin Bikes users were likely counted. 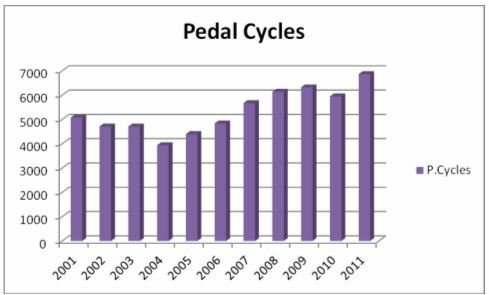 Over the 10 year period 2001 to 2011 the volume of pedal cyclists crossing the canal cordon during the morning peak period increased by 35.1%. There was a 41.9% increase in the period 2006 to 2011 and a 15.4% increase in the period 2010 to 2011. Other traffic decreased between 2010 and 2011, expect goods vehicles (up 18.4%) and taxis (up 0.9%). These was a year-on-year 10.3% decrease in motorcyclists, 8.7% decrease in buses and a 3.6% decrease in pedestrians crossing the count lines. The amount of cars crossing the canal at the morning peak has decreased 3.6% in one year and 10.9% since 2001. Just over 55,745 cars entered the area, but most only had one person inside them, with an average occupancy rate of just 1.25 people. See other details from the count in this Irish Times story here, or download the full report in Word or PDF formats below.